To some of us, this image is instantly recognizable. You know what it is and what you were doing when the event that created this footprint happened. Part of my job entails going into limestone quarries to provide a service to them. I got out of the Jeep to do my job and stepped into a fine powder, the residue of drilling holes for blasting. When, I stepped out of the Jeep and into this powder, instantly, a memory was triggered. Carole was in 1st grade. At the time, we belonged to the Cernan Earth and Space Center at Triton College. Eugene Cernan was the last man to walk on the moon, in December of 1972. He was at the Center and there was a member's only reception for him where he gave a presentation about space, what he saw and how he felt to be up there and looking back at the earth. Then he took questions from the audience. There was a highly political question about going back into space and colonizing Mars, which he answered rather well and quite deftly avoided the political comments. He scanned the audience for another question and picked a small hand to my right. It was my daughter. "What's the ground on the moon like?" she asked. Cernan's face lit up like a Christmas tree. You could tell he relished talking about the experience, plus, this was a rather smart question from a child. He talked about the dust. I remember that clearly. He talked about how some places, the dust was inches deep and they had to be careful where they were walking. They had to walk slowly. The space suits were big and bulky but you didn't want to kick up any of this dust because it wouldn't settle back down and you didn't want moon dust in your equipment. 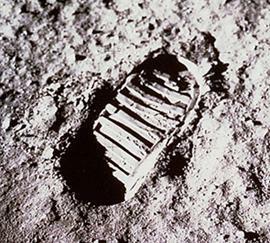 The footprint above, from Neil Armstrong's first step on the moon, will be there still, as perfect as it was in July of 1969, when it's July of 2969. There's no wind to blow it away. The full moon was last week, but as it moves toward half, it's been shining in my bedroom window, owing to these wonderfully clear nights. It's a comfort, a friend, an irritation when you're trying to sleep, a marker of seasons. I looked at it last night, mindful of the thoughts I would be sharing, and wondered if I would ever see grainy television transmissions from its surface again. How clear would transmissions be now, I wondered, given our technological advancements, many brought about by the very program that allowed that footprint to be implanted in lunar dust so many decades ago? So many program struggle for our attention and our tax monies that it's hard to say, "Yes, we'll give billions, trillions even, to revisit the moon." It was a national obsession, born of a time when one-upping another country was part of who we were. 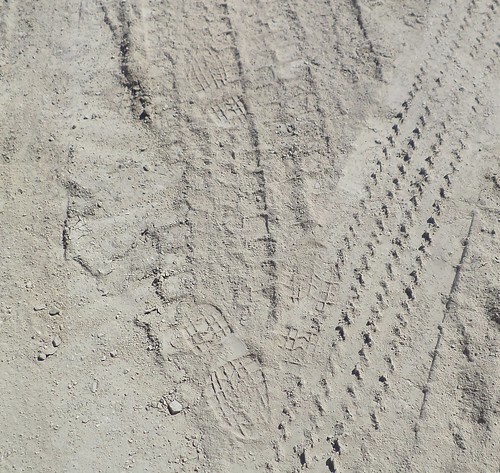 I look down at my dusty work boots and the footprints I leave behind. I look up at the shiny white orb in my night sky and I remember the oft-quoted sections of a poem by aviator John Gillespie McGee, Jr.